The Small Charities Programme is being supported by Esmée Fairbairn Foundation. The programme will deliver subsidised training for small charities, develop and collect resources to help small charities manage their finances and support the work of Community Accountants. The programme launches in January 2017 and will run to August 2017. Charity Finance Group (CFG) has today launched its Small Charities Programme for England and Wales – supported by a grant of £135,000 by the Esmée Fairbairn Foundation – at Hays Finance and Accounting Recruitment, London. Small Charities Coalition and NAVCA will be partnering CFG to support the delivery of the programme. 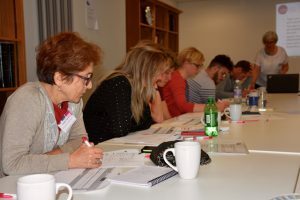 The Small Charities Programme aims to improve the financial capability of small charities across the country by delivering subsidised training on a range of charity finance topics from managing budgets to how to manage tax. In total, six half day modules on charity finance will be delivered across England and Wales, with the aim of providing 1,000 places for charities with an income of under £1m. Fees from the training will be used to fund a travel bursary programme to help small charities attend the training. The Small Charities Programme website (http://smallcharityfinance.org.uk/) is now live, offering , small charities the opportunity to book onto some of the trainings which start in January 2017. Further dates will be added over the coming weeks. The new website will also collect and signpost to a range of helpful tools and resources for small charities, and the programme will be developing and delivering new resources to help charities with their finances. In addition to providing direct support for small charities, the programme will support community accounting services. These are accounting services directed at community organisations (such as charities) which are often delivered by non-profit organisations or local councils for voluntary service. Many small charities depend on community accountants to meet their legal obligations and get financial advice. CFG will be convening a number of roundtables to discuss how these local services which have suffered following cuts in funding from local councils, can be supported.. The programme will also feature advice and surgeries for community accountants on how to improve their services. The programme will run to the end of August 2017, with an evaluation to be published after its completion. Charity Finance Group was set up in 1987 to promote financial best practice in the charity sector, it has nearly 1,400 members managing over £21bn in charitable income. Esmée Fairbairn Foundation was founded in1961 and is one of the largest independent grant making foundations in England, making grants to organisations which aim to improve the quality of life for people and communities in the UK, both now and in the future. Qu: What is the best thing and most challenging about working for a small charity? Finding funding is the most challenging. The most rewarding is seeing changes in individuals lives especially when you see people come to your organisation some with expectations some without and you are able to offer them practical help and support that brings about change for the good. Qu: What services do you offer and what do you do? WAND offers support and help to women in disadvantaged areas of London, this support can come in various ways one of which is health support, mental health support, sexual health and working through domestic violence and its repercussions. Qu: What are the financial management challenges do you face? Managing the finances in general can be challenging, keeping expenditure down, finding core funding, finding funding for salaries. Qu: How did the pilot training help you? We identified our needs and discussed these in our groups and the sharing of others experience and knowledge really helped a lot. Qu: What financial training would be useful for you moving forwards? More sharing of experience and knowledge from others, so we can learn and develop the work we are doing. To learn best practise, especially knowledge of Gift Aid and how to claim it. Qu: What are you 3 top tips for other small charities when it comes to good financial management? Keep your books up to date. Watch your income and expenditure. Make sure you have more money coming in than is going out. Qu: What was the last book you read or film you saw? I went to see a play ‘Showboat’ it was hilarious and it had a strong message that refreshed my soul and was very enjoyable. This blog is to share learning from this programme and to learn from others. The planning and development of this programme has been going on for the past year. CFG really hopes that those who work and volunteer in small charities and small groups will feel the freedom and the openness to ask for support and help when they need it and that you will be able to be open about the types of issues and questions that you need answers to even if the question seems SILLY. A big part of learning are the mistakes we all make and learning from them. Recently CFG held its first pre-pilot to trial the content of one of the modules and to see how different audiences would respond to it. Learning can be a very empowering thing especially when we are giving others access to good information, are intention with these pre-pilots is to learn as much as we can from them and those attending them to make the programme as beneficial as we can for all and this process is already underway and is a two way street. Thank you to all those who attended the first pre-pilot.